For some Cool indoor family fun in North Florida, come to the Jacksonville Ice & Sportsplex! Ice skating is fun and a great way to get some exercise indoors! Jacksonville Ice has skate rentals as small as size 6 for kids to size 12 men's! They are sure to have your perfect fit. This was Bryan's first time ice skating. Do you remember your first time ice skating? It sure was slippery! It definitely has a different feel than roller skating. For kids who are just learning how to ice skate, Jacksonville Ice rents a rink walker ($3) made of pvc piping, that just glides over the ice, while giving kids something to lean on while they get their bearings. Bryan loved the rink walker, and quickly became confident on ice skates. It was a very good workout for him! 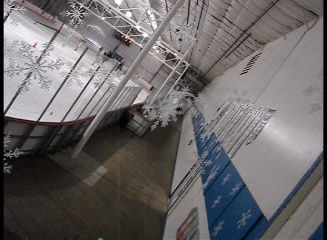 This facility has it all, they offer youth and adult hockey leagues, beginning ice skating lessons, figure skating lessons, and interesting summer camp programs for kids! Check out their calendar for open skating times! On Saturday nights they have a DJ! This would be a great place for a birthday party!! They have lots of video games, and skill games to play, while the Zamboni machine smooths out the ice at half time. Everyone had a good time! Next door at the Sportsplex,Youth Lacrosse 101 training classes are available to learn Lacrosse fundamentals. They also have basketball courts available for group rentals, as well as corporate party services, and more! We participated in a corporate party there recently, and everyone had a very good time, lots of fun, and lots of laughter, competitions, and team building. The food was catered by Sonny's Barbecue, and was very good. Call them for details on your next corporate party! We had a good time, and will be back! Hope to see you on the ice!